As I have stated repeatedly, I am constantly on the look-out for positive news about alternative medicine. Usually, I find plenty – but when I scrutinise it, it tends to crumble in the type of misleading report that I often write about on this blog. Truly good research in alternative medicine is hard to find, and results that are based on rigorous science and show a positive finding are a bit like gold-dust. But hold on, today I have something! This systematic review was aimed at determining whether physical exercise is effective in improving cognitive function in the over 50s. The authors evaluated all randomised controlled trials of physical exercise interventions in community-dwelling adults older than 50 years with an outcome measure of cognitive function. 39 studies were included in the systematic review. Analysis of 333 dependent effect sizes from 36 studies showed that physical exercise improved cognitive function. Interventions of aerobic exercise, resistance training, multicomponent training and tai chi, all had significant point estimates. When exercise prescription was examined, a duration of 45–60 min per session and at least moderate intensity, were associated with benefits to cognition. The results of the meta-analysis were consistent and independent of the cognitive domain tested or the cognitive status of the participants. The authors concluded that physical exercise improved cognitive function in the over 50s, regardless of the cognitive status of participants. To improve cognitive function, this meta-analysis provides clinicians with evidence to recommend that patients obtain both aerobic and resistance exercise of at least moderate intensity on as many days of the week as feasible, in line with current exercise guidelines. But this is not alternative medicine, I hear you say. Community-dwelling older adults (N = 118; mean age = 62.0) were randomized to one of two groups: a Hatha yoga intervention or a stretching-strengthening control. Both groups participated in hour-long exercise classes 3×/week over the 8-week study period. All participants completed established tests of executive function including the task switching paradigm, n-back and running memory span at baseline and follow-up. Analysis of covariances showed significantly shorter reaction times on the mixed and repeat task switching trials (partial η(2) = .04, p < .05) for the Hatha yoga group. Higher accuracy was recorded on the single trials (partial η(2) = .05, p < .05), the 2-back condition of the n-back (partial η(2) = .08, p < .001), and partial recall scores (partial η(2) = .06, p < .01) of running span task. I just wanted to be generous and felt the need to report a positive result. I guess, this just shows how devoid of rigorous research generating a positive finding alternative medicine really is. Of course, there are many readers of this blog who are convinced that their pet therapy is supported by excellent evidence. For them, I have this challenge: if you think you have good evidence for an alternative therapy, show it to me (send it to me via the ‘contact’ option of this blog or post the link as a comment below). Please note that any evidence I would consider analysing in some detail (writing a full blog post about it) would need to be recent, peer-reviewed and rigorous. Yesterday I prepared you for this event by alerting you to a disgusting cancer scam, and today I want to contrast this with more encouraging news from the strange world of alternative medicine. So I searched Medline for a fitting, recent publication showing at least some value of an alternative therapy. Believe me, such papers are few and far between. The aim of this Cochrane review was to assess effects of yoga on health-related quality of life, mental health and cancer-related symptoms among women with a diagnosis of breast cancer who are receiving active treatment or have completed treatment. The authors conducted extensive literature searches and applied no language restrictions. RCTs were eligible, if they (1) compared yoga interventions to no therapy or to any other active therapy in women with a diagnosis of breast cancer, and (2) assessed at least one of the primary outcomes on patient-reported instruments, including health-related quality of life, depression, anxiety, fatigue or sleep disturbances. Two review authors independently collected data on methods and results. The risk of publication bias was assessed through visual analysis of funnel plot symmetry and heterogeneity between studies. Subgroup analyses were conducted for current treatment status, time since diagnosis, stage of cancer and type of yoga intervention. Twenty-four studies with a total of 2166 participants were included, 23 of which provided data for meta-analysis. Thirteen studies had low risk of selection bias, five studies reported adequate blinding of outcome assessment and 15 studies had low risk of attrition bias. Seventeen studies that compared yoga versus no therapy provided moderate-quality evidence showing that yoga improved health-related quality of life, reduced fatigue and reduced sleep disturbances in the short term. There was an overall low risk of publication bias. Yoga did not appear to reduce depression or anxiety in the short term and had no medium-term effects on health-related quality of life or fatigue. Four studies that compared yoga versus psychosocial/educational interventions provided moderate-quality evidence indicating that yoga can reduce depression, anxiety and fatigue in the short term. Very low-quality evidence showed no short-term effects on health-related quality of life or sleep disturbances. Three studies that compared yoga to exercise presented very low-quality evidence showing no short-term effects on health-related quality of life or fatigue. No trial provided safety-related data. 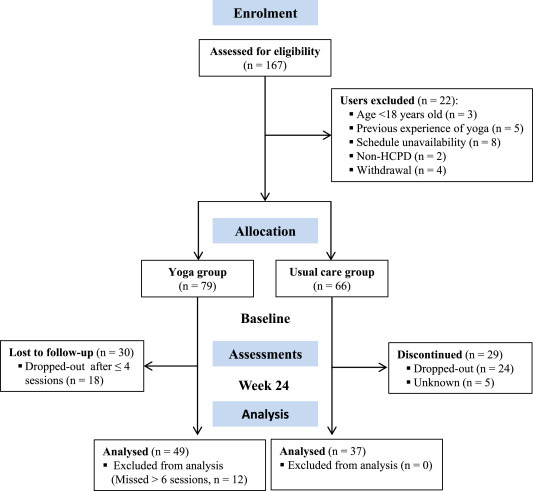 The authors concluded that moderate-quality evidence supports the recommendation of yoga as a supportive intervention for improving health-related quality of life and reducing fatigue and sleep disturbances when compared with no therapy, as well as for reducing depression, anxiety and fatigue, when compared with psychosocial/educational interventions. Very low-quality evidence suggests that yoga might be as effective as other exercise interventions and might be used as an alternative to other exercise programmes. As I said, this is most encouraging. Many women are attracted by yoga, and the news that it can improve their symptoms is clearly positive. I have said it often, but I say it again: in supportive and palliative cancer care there might be an important role for several forms of CAM. One has to make sure though that they do not interfere with conventional treatments, and – this is very important – cancer patients must not be misled to believe that they can be used to treat or cure cancer. Finally, patients should not pitch their hopes too high: the effect sizes of alternative treatments in cancer care are invariably small or modest which means that they can help to reduce symptoms but are unlikely to get rid of them completely. On an even more sober note, I have to reiterate that none of the trials included in the above review reported safety data (yoga is not totally devoid of adverse-effects!). This is an almost stereotypical finding when assessing clinical trials of alternative therapies. It discloses a clear and unacceptable breach of publication ethics. How can we ever get a realistic impression of the risks of alternative medicine, if adverse effects remain unreported? It is high time that researchers, authors, journal editors and reviewers get this message and behave accordingly. In alternative medicine, good evidence is like gold dust and good evidence showing that alternative therapies are efficacious is even rarer. Therefore, I was delighted to come across a brand-new article from an institution that should stand for reliable information: the NIH, no less. This is excellent news! Finally, we have data from an authoritative source showing that some alternative treatments can be recommended for common pain conditions. Hold on, not so fast! Yes, the NIH is a most respectable organisation, but we must not blindly accept anything of importance just because it appears to come form a reputable source. Let’s look a bit closer at the actual evidence provided by the authors of this paper.